This post first appeared on A Platform for Good – a new project from the Family Online Safety Institute. When I was still in the classroom, my fourth graders engaged in an interdisciplinary study of Africa culminating in an Africa Travel Fair. Students created booths to advertise a country, and the school community visited the event. During my first year, we built an Africa web site. While they enjoyed the process, the lack of a tangible product made the effort feel hollow, so in the following years, we focused on physical projects. Over six years, no one questioned the increased use of technology. However, when I talk to elementary teachers about bringing iPads into their classrooms, they often express concerns about screen time, sacrificing tangible developmental opportunities, or the need to encourage face to face interaction. While this dichotomy between the physical and digital seems more obvious when working between classroom and computer lab, the lines become blurred as iPads proliferate classrooms. Rather than thinking about using iPads to digitally create physical learning objects, the power lies in how they digitally extend the physical world. 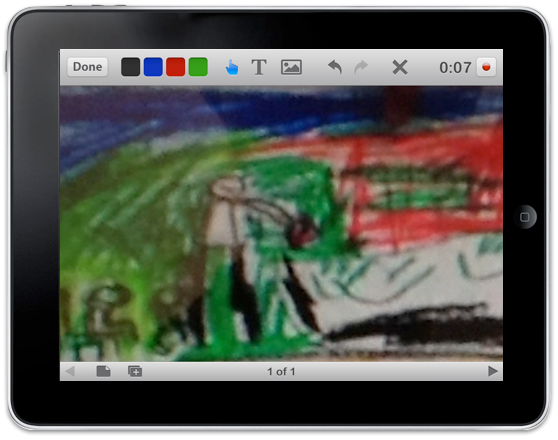 Upon completion of their drawings, students take pictures of each illustration and then incorporate them into a screencasting app such as Explain Everything or Educreations. They could then record themselves narrating their stories. The completed videos could be posted to a class website or blog, allowing a project previously confined to paper to be shared with a broader community. In Kristen Wideen’s combined grade 1-2 class, iPads allow her to capture her students thinking while working independently. 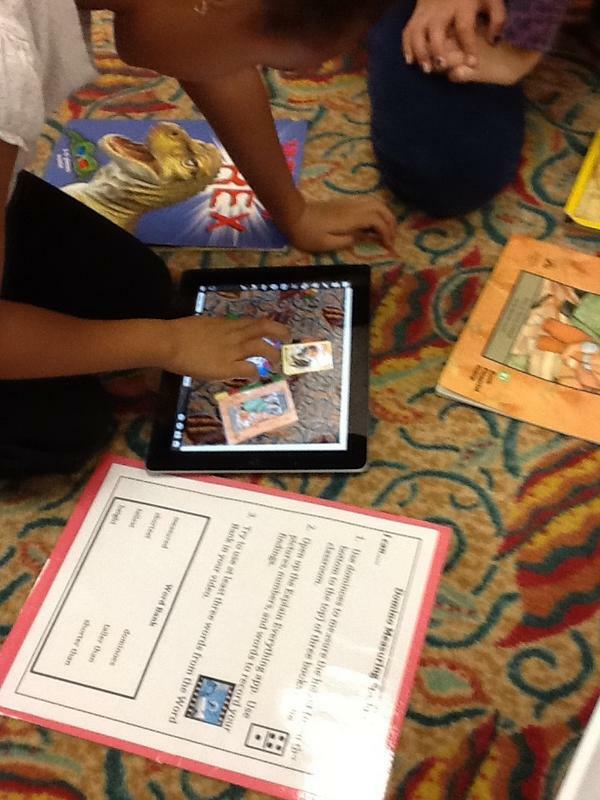 She incorporates familiar physical objects, and then leverages iPad to record their learning process. For example, to reinforce the abstract concept of units of measure and size comparisons, Kristen has students measure books with dominoes. Though this activity could be completed without iPad, integrating the device allows her to capture students’ thinking and learning as well as document her students’ progression. Lego spaceships, drawings, songs – consider the myriad masterpieces created by younger students that often go unrecorded. iPads provide teachers with a way to not only capture physical creations, but also to give even the youngest students a voice. Imagine taking pictures of a student’s lego tower, saving it into an app such as Evernote or Bookcreator, and then recording that student as she describes her thought process. Envision capturing a student’s reading fluency and then adding your own notes to later review with his parent. Consider the feedback potential if teachers videoed their students explanations (as illustrated below) and then added it to a portfolio. With iPad, this is all possible, ensuring that critical learning moments no longer disappear at the end of the day. Beth will be talking about combining the physical and digital at conferences this fall including the November 13-15 EdTechTeacher iPad Summit.